Coating thickness - coulometric method is a device which is used to measuring coating thickness by using coulometric method. It is designed by our expert professionals by using quality material and sharp edge technology. This coating thickness - coulometric method is available in different specifications and dimensions to meet the varied needs if the customers. This coating thickness - coulometric method is used for measuring thickness of various single coating and multi coating layers. Furthermore, its external body is made of supreme quality metal. 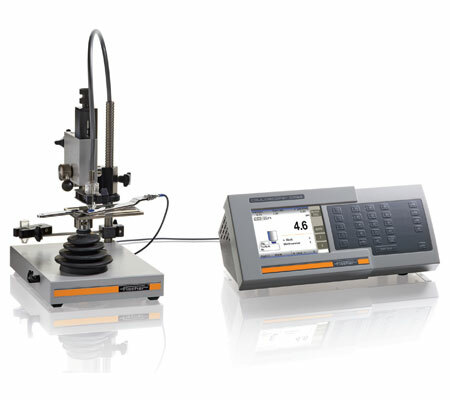 This benchtop coating thickness measurement unit – Couloscope CMS2 is used to measure metallic coating over the metallic and non metallic substrate. It can measure both single layer and multi-layer coating. It is provided with graphical display for having a clear view of measurement. It has various predefined measurement applications for various types of metal coatings. Our benchtop coating thickness measurement unit – couloscope CMS2 has selectable measurement units and has various display languages options such as Asian, South American and European. Selectable Measurement Units 1/4m or mils. coatings, if non-destructive methods cannot be used. The COULOSCOPE CMS2 instruments measure the thickness of virtually any metallic coating on metallic or nonmetallic substrates. Measurement of single coating and multi coating systems. Graphical display for clear view of the measurements, the set coating system and the parameters as deplating rate and test area size. Graphical display of the cell voltage on the LCD screen. Many predefined measurement applications for the most metal coatings. Selectable measurement units: μm or mils. European, south american and asian display languages. Couloscope CMS2 step is basically a measuring instrument which is widely demanded in different industries of measuring of coating thickness. It is designed precisely and can also measure electrochemical potentials. This couloscope CMS2 step is highly appreciated amongst customers for its precise measurements and dimensional accuracy. It is equipped with LCD digital display which efficiently shows readings of the measurements. coatings in a simple standard-conforming manner.